Aletia formosana Butler, 1880, Proc. zool. Soc. Lond., 1880: 675. Leucania adusta Moore, 1881, Proc. zool. Soc. Lond., 1881: 335. Sideritis conferta Warren, 1913 In Seitz, Gross-Schmett. Erde 11:94. Aletia formosana Butler; Calora, 1966: 686; Holloway, 1976: 9. Diagnosis. The ground colour of the forewings of this and the next species is pale yellow, with the darker markings reddish. 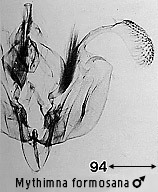 The only reliable way of distinguishing formosana from the next species is by examination of the male genitalia: the sacculus is elongate rather than rounded formosana, and the cucullus is narrower, more strongly asymmetrical and with a costal process or digitus. Geographical range. Indian Subregion to Japan, Taiwan, also Borneo, Philippines and Sulawesi, with ssp. conferta Warren in Queensland. Habitat preference. On G. Kinabalu the species was taken between 1000m and 2000m.